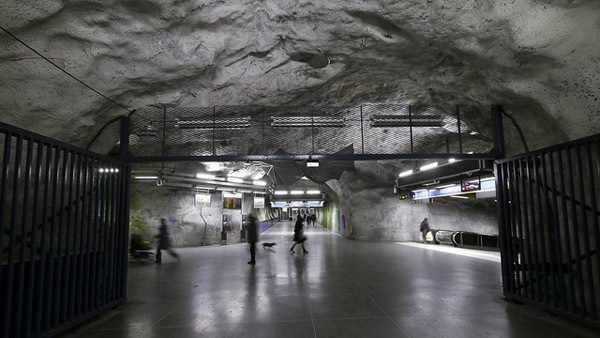 The subject matter of this photo is interesting enough — the cave-like Fridhemsplan station in Stockholm’s Metro system. What’s awesome about the photo is the deep depth-of-field, the small flashes of color from the video screen and the white strips of light that don’t distract from the overall scene. On top of that, there are just enough people in the frame to give the scene a human element — and canine one, too! The photo was taken with a Panasonic DMC-GH2, a DSLR camera. The image was exposed at 1/8 of a second shutter speed, an aperture of f/4.0, a focal length of 7 mm and a 400 ISO. Flash was not used. It was processed with Photoshop.